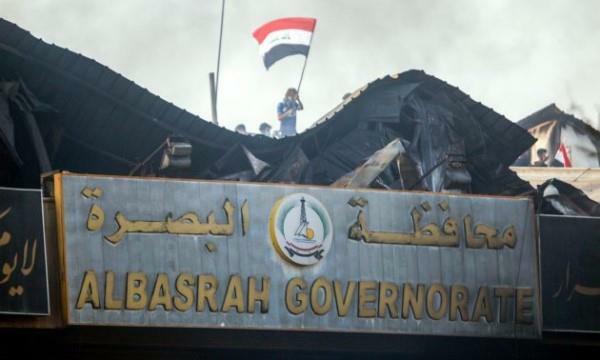 Basra protesters set the Iranian consulate ablaze on Friday night, the latest manifestation of outrage against influential actors in Basra city, which should be one of the richest in the country with its massive oil reserves and port, but which has become one of the most decrepit. More than 18,000 Basra residents have been poisoned by tap water since the start of the month, according to the Basra province health directorate. Hospitals, inundated with patients, have collapsed under the pressure. Basra, like neighboring Iran, is majority Shiite. But in recent years, residents have grown hostile toward Tehran over its dominance of Iraqi affairs, its support for political parties notorious for public waste and its backing of armed factions that enforce themselves as morality police. The torching of the Iranian consulate came just 24 hours after the protesters — ignoring a government curfew — set fire to the offices of powerful Shiite political parties and Iran-backed militias that formed the backbone of the paramilitary Popular Mobilization Units. The demonstrators did not spare the local government headquarters and provincial council, setting those ablaze as well. Basra has been roiled by unrest since July, and the latest round of revolt was met with tear gas and live fire. The first week of September saw nine demonstrators killed and 93 wounded, according to the UN. The deadly force has only inflamed the movement. Over the past two nights, security evaporated from the streets while the military kept to the sidelines. Angry groups of youths roamed the city center, demanding revenge for those killed and for years of neglect. The city appears out of control. The unrest has put a spotlight on corruption in Iraq's economic capital, just as the Ministry of Oil seeks foreign investment – including from China – to transform the country from an importer of oil products to an exporter. Demonstrators on Thursday shut down the country's most important port, Umm Qasr. Basra province is Iraq's only outlet to the sea, and Umm Qasr is just one of five commercial sea ports that serve as the country's main gateway for basic necessities. The costly shutdown prompted the minister of transportation to call for restraint via local radio stations. 'Iraq is losing millions,' Kadhim Finjan pleaded over the airwaves. The port was eventually reopened Saturday before dawn. Like the oil fields, these critical hubs have drawn protesters, who see the wealth they create being siphoned off by corruption. The ports – strategically placed on the Persian Gulf – are shared between the political parties, a phenomenon that saps their revenues and allows goods to enter without passing through customs. An officer with the port authority, who spoke to Asia Times on condition of anonymity, said it was 'impossible' for security to control the port. 'The political parties treat the ports like their private property. Goods are exempted from controls and inspection, and the taxes are reduced for traders dealing with the ruling parties,' he said. Before the ports earned the ire of the demonstrations, it was the oil sector. Basra's 15 oil fields account for nearly 60% of the country's oil reserves. Revenues from the province generate approximately $60 million daily, or 3.6 of Iraq's total 4.3 million barrels per day. The government relies on the sector to finance its activities, but only a fraction of the national budget flows back to Basra. The stark contrast between Basra's oil wealth and the miserable conditions of the population has prompted demonstrators this summer to organize sit-ins blocking the gates to the oil fields. In addition to the 15-hour power cuts and filthy drinking water, they are demanding jobs. Foreign companies operating in Basra are required to hire locals for at least 50% of job posts, and up to 80% depending on the contract. But those laws are often flouted. The government has also allowed foreign companies to acquire vast swathes of agricultural lands to be used as oil fields north of Basra, resulting in the bulldozing of orchards and date palm fields and increased unemployment. 'The oil extracted from our city lands is not beneficial to us,' one demonstrator told Asia Times. 'It is better to stop its extraction than have it stolen,' he said, blaming the government and foreign companies alike. According to provincial council member Ahmed Abdel Hussein, half of Basra residents live in poverty. The government says unemployment stands at about at 7.8%, but academic studies suggest a far higher rate. There are no official statistics for the province. The government in Baghdad fears the deteriorating situation in Basra could disrupt oil production. 'The oil companies have been greatly affected by the protests,' said Adel al-Thamari, an academic and investment analyst in Basra. The decline in production puts the financial burden on Baghdad. 'Companies will raise the terms of credit, which means a great loss for Iraq, which will have to pay compensation to the companies,' he said. Along with the world's major oil companies, hundreds of logistics and security support companies provide operational services to the fields in Basra. As security deteriorates, they too will have to withdraw. 'The withdrawal of these companies would mean production stops,' Thamari said. The concerns of oil companies go beyond the protests to fears of a militia takeover. "The army has taken the position of neutrality toward the demonstrations, and the fear is that the Popular Mobilization Units will deploy. This would cause a further deterioration of security, because the militias have their own internal divisions and such an escalation could neutralize the official security forces,' Thamari said.